Beautifully hand painted Strawberry Flower Fairy figurine. Optional gold string and wire pick included for securing in your display. Individually packaged in its own window display box that includes a biography of the artist, Cicely Mary Barker. The things that displease the fairies are greediness and ingratitude. They don't like their fruits to be snatched at, and hoarded selfishly. Before going to bed tonight, stand at an open window and say, "Thank-you kind fairies for your wonderful present of fruit." 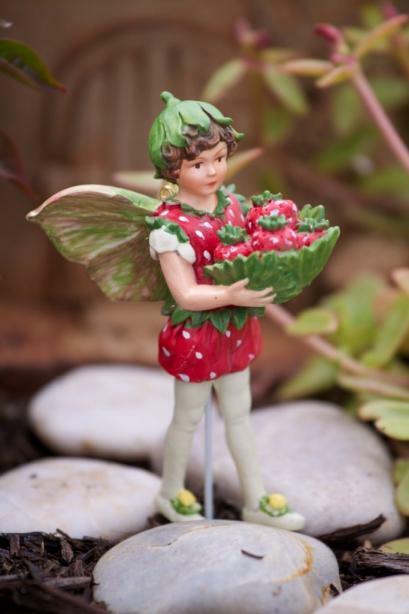 Beautifully hand painted Strawberry�Flower Fairy figurine. Optional gold string and wire pick included for securing in your display. Individually packaged in its own window display box that includes a biography of the artist, Cicely Mary Barker.